This sushi restaurant is about a 7-minute walk from the Togetsukyo Bridge in the tourist hotspot of Arashiyama. The restaurant is famous for its mackerel sushi, known in Japanese as saba sushi. There are also several a la carte options made with fresh fish. 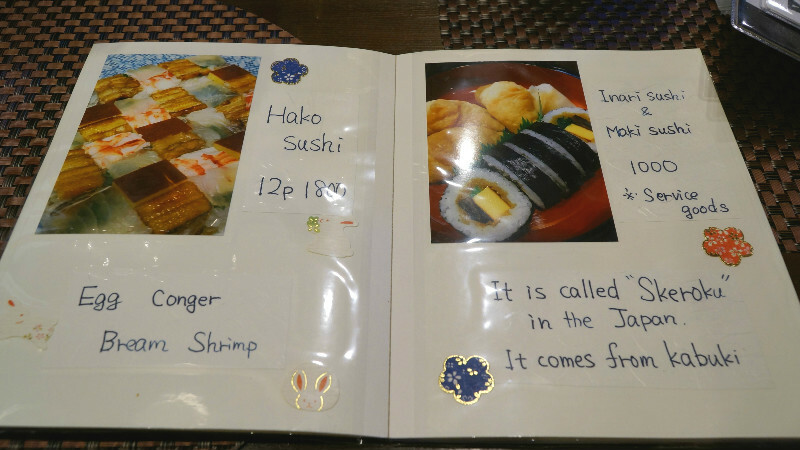 The restaurant also has some sushi that use unusual ingredients, all of which go well with sake. Going with a group of people to try various kinds of sushi is also recommended. Inside the restaurant is like a typical Japanese home. The wooden shelves and tables, clocks, and toys sitting around are fun just to look at. The environment is very relaxed. From the counter seats, you can watch the owner making sushi right in front of you. Sasamaki sushi features the sweetness of the white fish - bream. The little leaves on top of the rice are Japanese pepper tree leaves. They bring out the flavor of the sushi with their subtle fragrance. The best saba (mackerel) is selected every month to make the saba sushi. Since the rice is flavored with soup stock, this sushi is best eaten without soy sauce. Take off the seaweed wrapping before eating. Three pieces of saba sushi go for 900 yen and sasamaki sushi is 300 yen per piece. This is the sushi dish for the Instagram generation. It’s called hako sushi because it’s made using a box-like tool, and because of this the shape of it is really beautiful. You get 12 pieces with each containing two different ingredients. You have Japanese omelet, bream, conger eel, and shrimp on top of the rice. There is a surprising amount of rice in this dish so it’s very filling. This dish is made with shrimp, eel, white fish (bream), and shiitake mushrooms on top of rice with vinegar. The rice has just the right amount of tartness and balances perfectly with the flavor of the toppings. The dish looks very colorful, too. The round wooden bowl is packed full. Use the wooden spoon to scoop up food from the bottom of the bowl and place it on the small dish to eat. This dish is made with finely cut tuna covered with a generous topping of grated Japanese yam. Don’t be afraid to stuff as much of the tuna and thick, gooey yam into your mouth as you can handle. The dish is accented with wasabi, nori, and shiso leaves. This one also goes well with sake. It’s not found on the English menu so show the staff this picture if you want to order this dish. They have their menu in English so ordering is easy. Not all of their menu is translated into English, so if you’re feeling adventurous we recommend also ordering from the Japanese one. After sitting at the table, ring the little golden bell on the wall to get a staff member to come to you. Here you can enjoy many different kinds of sushi often eaten in Kyoto! Partly because the owner is a fan of alcohol, lots of the sushi is delicious with sake. The restaurant is small, so we recommend going in a group of no more than 3-4 people. If you want to eat unique Kyoto sushi instead of nigirizushi, head to Daizen. Stop by here for some Kyoto style sushi when you are in Arashiyama! The interior is decorated with several vintage items resembling a typical Japanese home. Japanese old tunes are playing in the background. I really liked the Mibuna Maki which are sushi roll with leafy Mibuna vegetables. Sasa Sushi are interesting because it is made with a leaf wrapped around it. You could sit at the table in the front or sit at the sushi counter in the back! The restaurant sometimes closes early if food is sold out. Also, several dishes are only available in certain seasons.